An Ekiti State High Court has sentenced two men, Ariyo Ayodeji, 22, and Ayodele Oluwakayode, 20, to death for armed robbery. 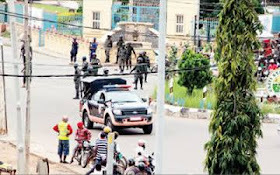 They were arraigned on a four-count charge of conspiracy and armed robbery contrary to Section 516 of the Criminal Code Cap C16 Laws of Ekiti State and Section 402(2) of the same law. Justice Lekan Ogunmoye of High Court 6 sentenced them to five years imprisonment for conspiracy and death by hanging for armed robbery. According to the charge sheet, the convicts on March 1, 2016 at Plot 18 in Oke Osun area of Ikere-Ekiti robbed Mrs Stella Faniyi of her hand bag. The bag contained one Nokia Lumia handset, one Airtel registered handset, an Automated Teller Machine (ATM) card, a Bible, one hymn book and money. The convicts pointed guns at the victim while she was returning from church and ran away. The incident was reported at Ikere Police Station. The convicts on March 18, 2016 also robbed Mrs Bunmi Arije at 11 Avenue, Federal Housing Estate along Afao Road, Ado-Ekiti at about 8pm. They dispossessed her of a Blackberry and Samsung phone, one ATM card, a bunch of keys, a driver’s licence and N9,000 cash. Shortly after robbing Mrs. Arije, the convicts were arrested by policemen during a stop-and-search exercise. Prosecution counsel, Mrs. Olukemi Daniel-Ojo, called four witnesses and tendered exhibits including the statement of the accused, weapons and the stolen items recovered from them. In his verdict, Justice Ogunmoye said: “On conspiracy, the two accused persons are sentenced to five years imprisonment on each count of conspiracy.